The third weekend of March was the last weekend of winter and also the last weekend before my vacation. It would be a month before I come back to New York so I decided to walk the length of Central Park. The south end of the park, particularly up in Cat Rock has always given me amazing views of midtown Manhattan. Here was my view last Saturday near the tail end of my walk. I started my walk at the northernmost part of the park, the Harlem Meer. The sky was full of grey clouds but the Meer always look beautiful in whatever weather. This is Harlem Meer with the buildings of 110th Street at the back. The Conservatory Garden is right next to the Meer. There were still no flowers blooming in the French Garden but the crabapple trees at the Center Garden were already starting to bud. 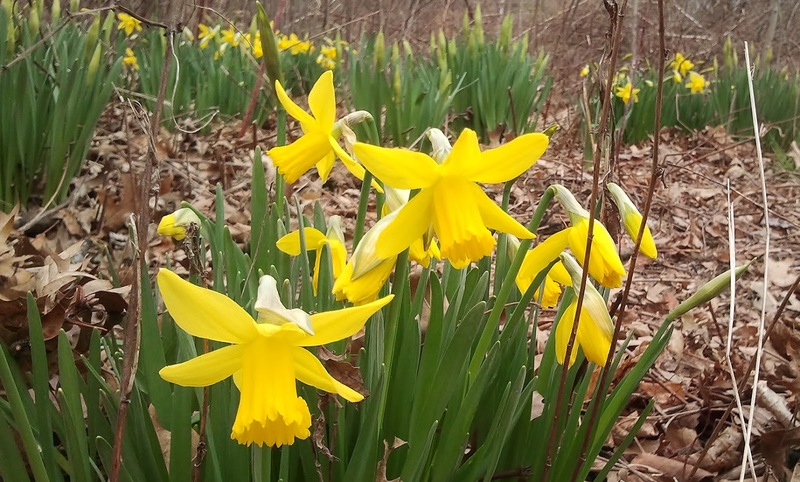 At the English Garden, several early spring blooms were already flowering. I was pleasantly surprised to see some iris reticulata. They usually come in blue or purple. Look how pretty they are. From the Conservatory Garden, I walked west towards the North Woods passing through the East and North Meadows. The North Meadow was still closed for the season. At the north end of the North Meadow, near the middle part is one of the park's enchanting entrance to the North Woods, the Springbanks Arch. The North Woods is full of trees but as of the time of my walk they were still bare, but the birds were enjoying flitting through the trees. It was exciting to see them, more so when I was able to get a picture of a downy woodpecker for the first time! I love walking through the North Woods, it is so peaceful with only the bird songs, the wind on the trees and the sound of the waterfalls to break the silence. I also love the rustic bridges, I think there are three of them in the North Woods. And like the rest of the arches and bridges, all the rustic bridges have different designs. I came out of the North Woods through the Glen Span Arch which led to the Pool section of the park. There were a lot of waterfowl enjoying the Pool, which included mallards and buffleheads. It was also near the Pool area where I saw the first daffodils of the season, they brightened a very grey day. I then made my way to the Jacqueline Onassis Reservoir through the bridle path that winds around it. At the north end is Gothic Bridge, looking so graceful and beautiful. There were lots of waterfowl at the Reservoir like the American coot and the hooded mergansers. I would have stayed a little bit longer to enjoy watching the birds but there were snow flurries so I tried to hurry up with my walk. I then proceeded to Summit Rock, the highest natural elevation in the Park, hoping to get some good shots of midtown Manhattan. The view wasn't good as the snow flurries were starting to get heavier. 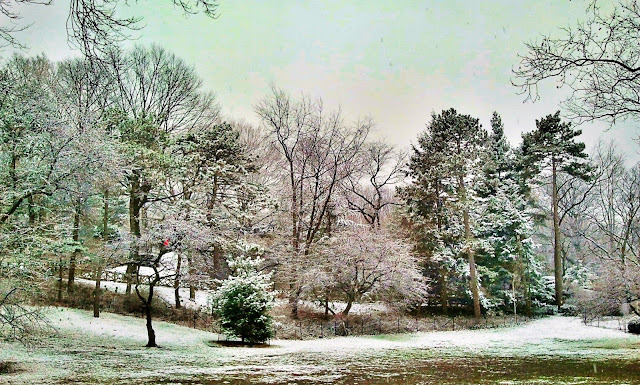 When I went down, this was how the Arthur Ross Pinetum looked like with the snow flurries. I still walked on and was relieved when I saw Winterdale Arch. It provided shelter from the snow flurries which didn't seem to abate. Since it was past noon, I decided to get some lunch from one of the stores along Central Park West and also bought an umbrella so I could continue my walk inspite of the snow. After lunch, I went back to the park at the 81st street entrance and this was the scene that greeted me. Central Park has turned into a winter wonderland! I then proceeded to Belvedere Castle and, from its upper balcony, saw that the Great Lawn was already blanketed in white. From there, I turned east and passed by the pine trees in Cedar Hill. The view looked like a postcard sent during the Christmas holidays. From across the Conservatory Water, Hans Christian Andersen can still be seen sitting at his usual place. I then proceeded back inward to go to Bethesda Terrace. There were still some people braving the snow, and the arcade, with its beautiful Minton tiles ceiling, is always a welcoming place. 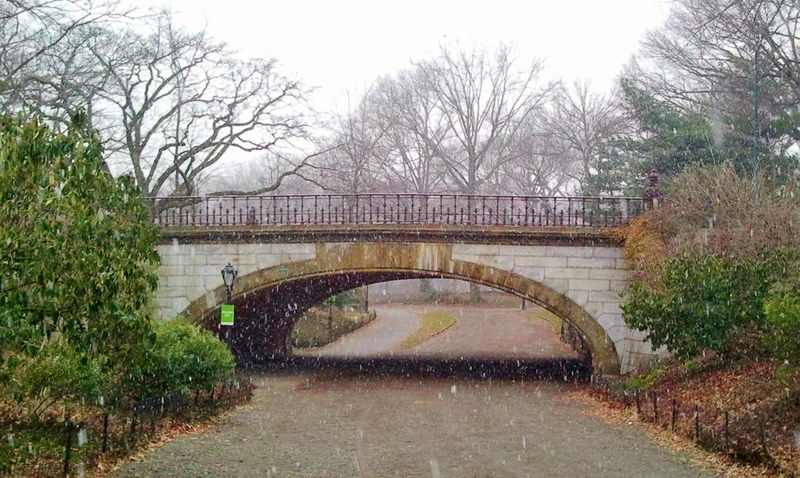 The graceful Bow Bridge, as always, was a sight to see no matter the weather. You could almost see the early spring flowers decorating the giant urns at the end of the bridge. I then made my way back south, walking along the Mall. In summer, these American elm trees bring much needed shade to the park. During winter, the snow clinging on the trees make the place look magical. I am nearly at the end of my walk but passed by Sheep Meadow, which was still closed for the season. After climbing Cat Rock and taking the first pic posted above, I've finally reached the southern edge of Central Park, The Pond. Crossing the Pond is Gapstow Bridge which also gives you great views of midtown Manhattan on ground level. I started this blog post on the plane on my way to my vacation place, the very warm and sunny Philippines. When I left New York, it snowed the day before and I think winter didn't want to leave the city. Spring has officially started and I'm looking forward to walking again in the park that I love, amidst the budding trees and blooming flowers. See you in April Central Park! Last Saturday I was planning to walk from Battery Park City (BPC) up to the Brooklyn Bridge but ended up walking along BPC only. I only intended to drop by Central Park in the morning and take a few pics but the views there were so captivating so I stayed a little bit longer and it was already nearly noon by the time I reached the BPC area. 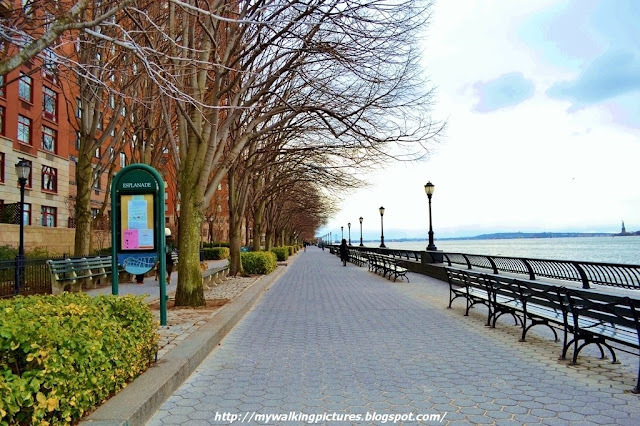 Battery Park City is a 92-acre planned community at the southwestern tip of Lower Manhattan. The land upon which it stands was created by land reclamation on the Hudson River using over 3 million cubic yards of soil and rock excavated during the construction of the World Trade Center, the New York City Water Tunnel, and certain other construction projects, as well as from sand dredged from New York Harbor off Staten Island. 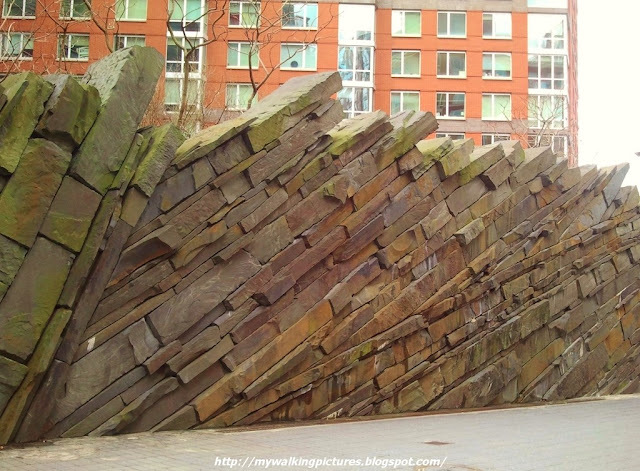 It is named for adjacent Battery Park. 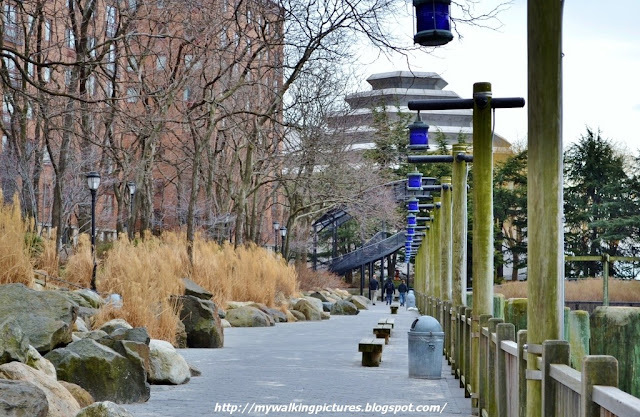 This is the BPC Esplanade, it has great views of the Hudson River, New Jersey and Lady Liberty. I took the 2 train and got off at Chambers Station, and from there walked westward to BPC and got a great view of One World Trade Center, now the tallest building in Manhattan. I wanted to visit first the Nelson A. Rockefeller Park which is the northmost park in the area. On the way there, I passed Teardrop Park. It's my first time in this park and it was a pleasant surprise to stumble on the icewall. The park was in the middle of several buildings and looks like a kind of secret garden waiting to be discovered. Designed by innovative landscape architect Michael Van Valkenberg, two-acre Teardrop Park brings a little of the dramatic Hudson River Valley to Battery Park City. Located between Warren and Murray Streets, River Terrace and North End Avenue, Teardrop features a magnificent "Ice Wall," artwork by Ann Hamilton and Michael Mercil, a children's slide, sand boxes, water play, a reading area with rock seats, places to "rock hop," naturalistic plantings, and much, much more for park lovers to discover. From Teardrop Park I proceeded to the Nelson A. Rockefeller Park at the north end of BPC. The park contains most of BPC's wide lawns, as well as a large playground, plantings and gardens, several public art pieces, and a sheltered pavilion. What I love about this park is the many sculptures by Tom Otterness called The Real World. 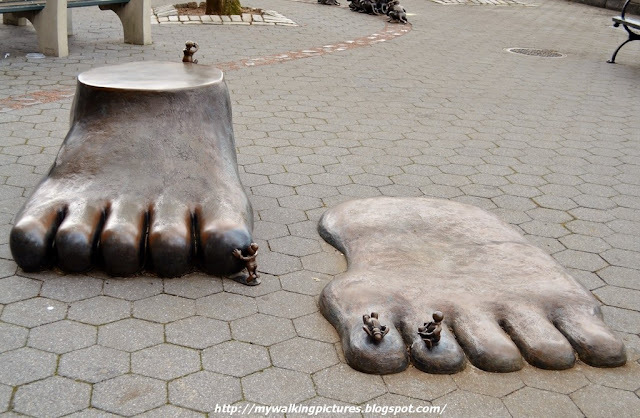 The Real World consists of an elaborate fountain decorated with pennies of all sizes. Rolling out of the fountain is an exploded penny that Otterness’s classic figurines are trying to roll away. Throughout the rest of the park pudgy little figures are seen climbing all over tables and chessboards as well as comically hanging off lampposts. A short walk from The Real World is the Irish Hunger Memorial. 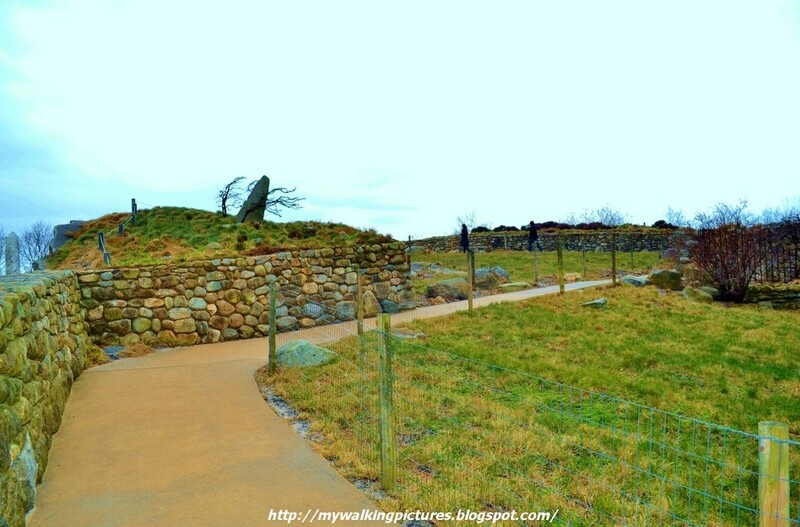 It's a uniquely landscaped plot, which utilizes stones, soil, and native vegetation brought in from the western coast of Ireland, and contains stones from all of the different counties of Ireland. The memorial also incorporates an authentic rebuilt Irish cottage of the 19th century. Dedicated on July 16, 2002, the Irish Hunger Memorial (which takes its name from the Irish term for the famine of 1845-52, "An Gorta Mor," The Great Hunger) stands on a half-acre site at the corner of Vesey Street and North End Avenue in Battery Park City, between the Embassy Suites Hotel and the Hudson River. In March, 2000, the Authority commissioned the design of "a contemplative space, devoted to raising public awareness of the events that led to the Great Irish Hunger and Migration of 1845-1852." The Memorial was intended to serve also as a catalyst for addressing current issues of world hunger. The above pic is the facade of the memorial, and if you'll just pass by, you'll never know that inside is a slice of Ireland. The Irish Hunger Memorial also has great views of One World Trade Center. Walking further along the esplanade I finally reached the World Financial Center area. 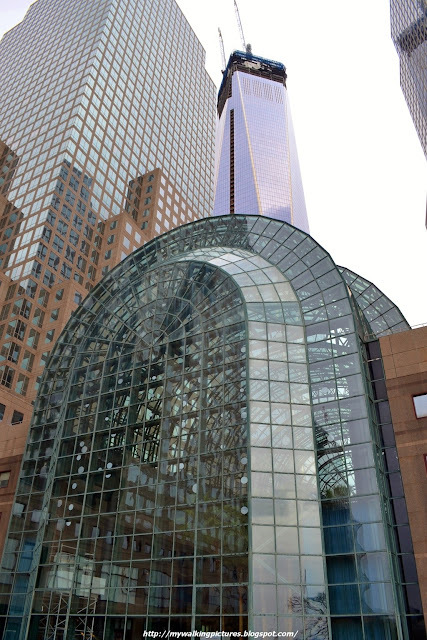 The World Financial Center is comprised of four glass and granite towers, which surround and define a 3.5-acre public plaza at the water's edge. 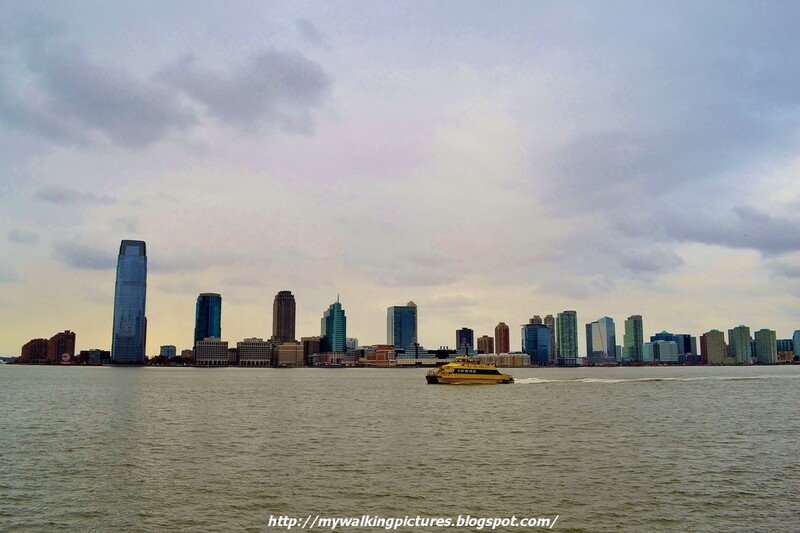 A landmark in open space design, the World Financial Plaza is the first waterfront plaza built on the Hudson River. 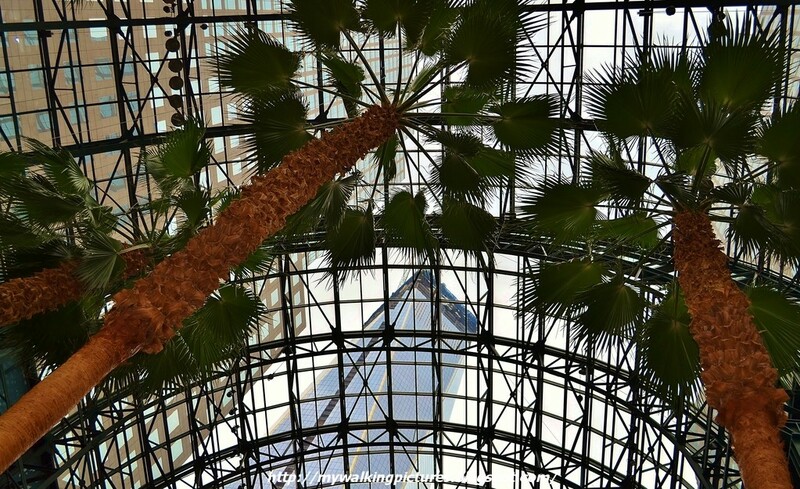 The 10-story high, glass-enclosed Winter Garden, contains shops, restaurants, and seating areas, and opens directly onto the World Financial Center Plaza surrounding the North Cove Harbor. The Winter Garden Atrium is a 10-story glass-vaulted pavilion originally constructed in 1988, and substantially rebuilt in 2002. 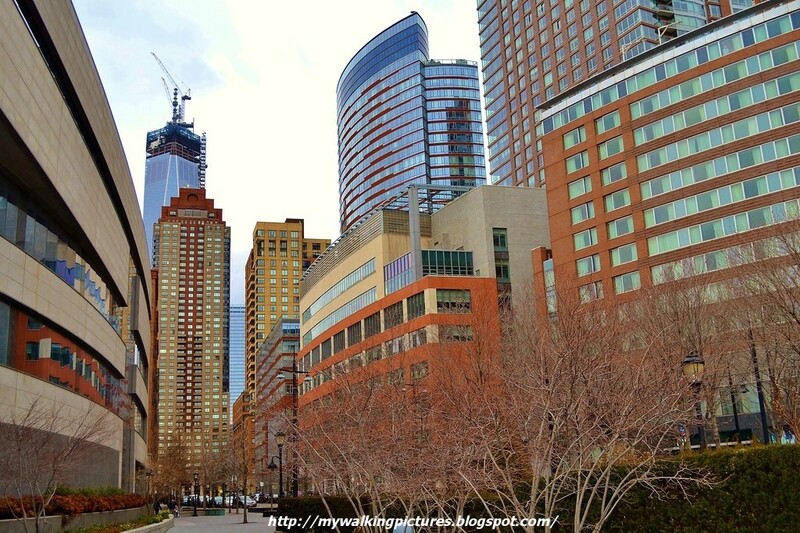 The rear of the building opens onto the World Financial Center Plaza and the North Cove Yacht Harbor on the Hudson River. The Atrium was originally connected to the World Trade Center via a pedestrian bridge that spanned the West Side Highway. It was severely damaged in the September 11, 2001 attacks as almost all the glass panes were blown out by the dust clouds. The pedestrian bridge was destroyed in the same attacks and was replaced by windows facing the former site of the World Trade Center. 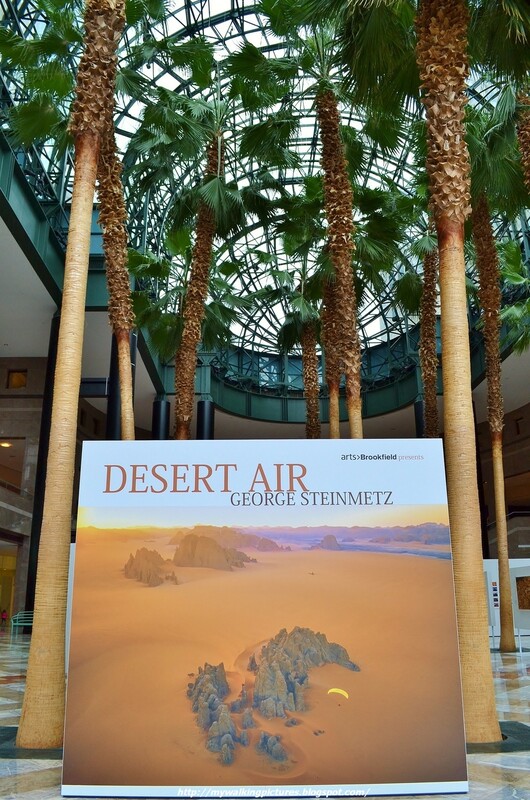 When I was there, the windows facing the World Trade Center site were blocked, I guess due to the ongoing renovation, but the Washington robusta palm trees were a welcome sight, especially on a cold winter day. At the time of my visit, there was an exhibit of George Steinmetz's Desert Air, featuring various scenes of the different deserts around the world. 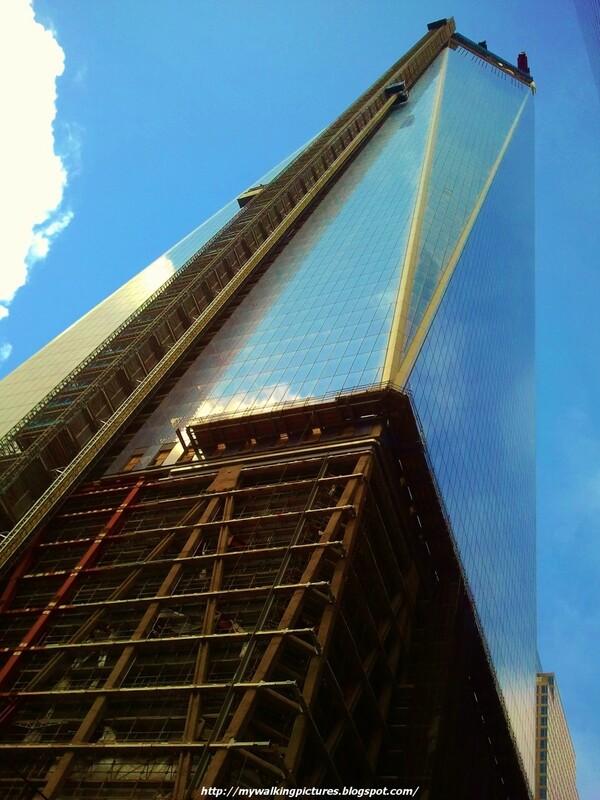 Looking up at the Atrium glass ceiling, you can see the top part of One World Trade Center. 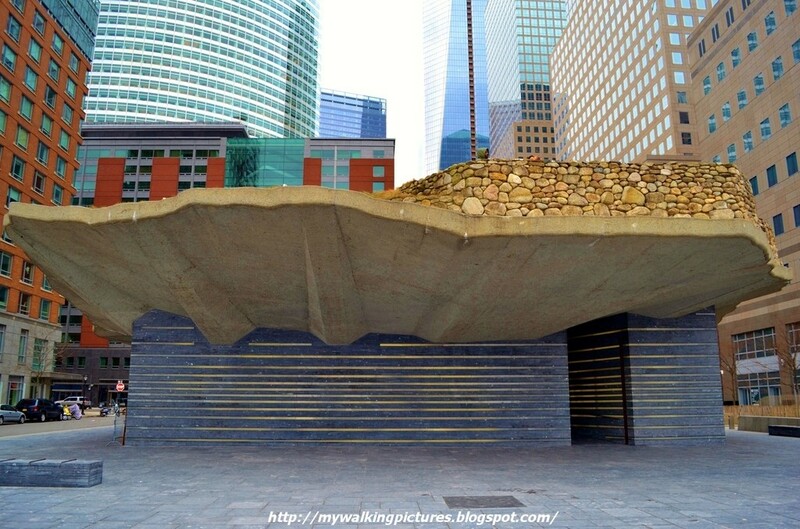 Outside at the World Financial Center Plaza, I came upon this public art by Amy Kao titled Field Guide to a Metropolis. 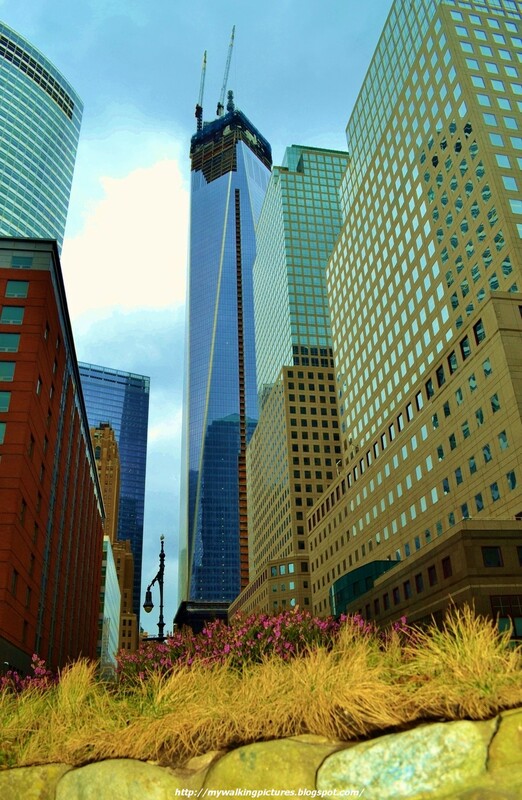 Near the World Financial Center is the New York Police Memorial. The wall along the edge of the memorial holds the names of the officers and dates on which they were killed. The small fountain resides outside of the formal memorial represented the rookie's first day. The water flows down the flume past the granite wall, representing death, and then falls into the open pool. The remaining area around the pool is referred to as the "Sacred Precinct" where contemplation is encouraged. 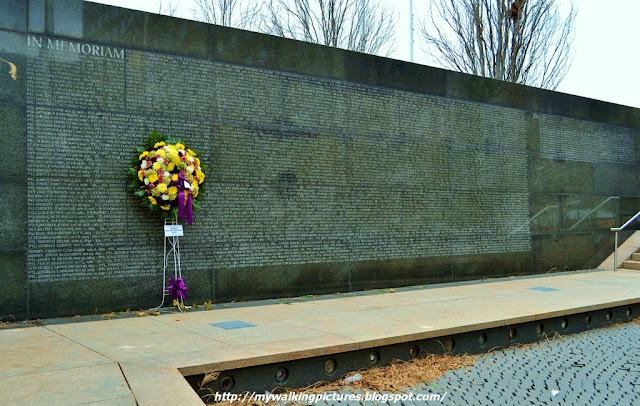 At the time of my visit, the water was turned off for the season but you can look for the names on the memorial wall and pay respects to those who lost their lives in the line of duty. I then went to Kowsky Plaza as I wanted to see the single panel of Berlin Wall on display there but the area was cordoned off for repairs so I kept on walking along the esplanade. The esplanade also gives you a great view of New Jersey across the Hudson River. At the end of the esplanade is South Cove Park. 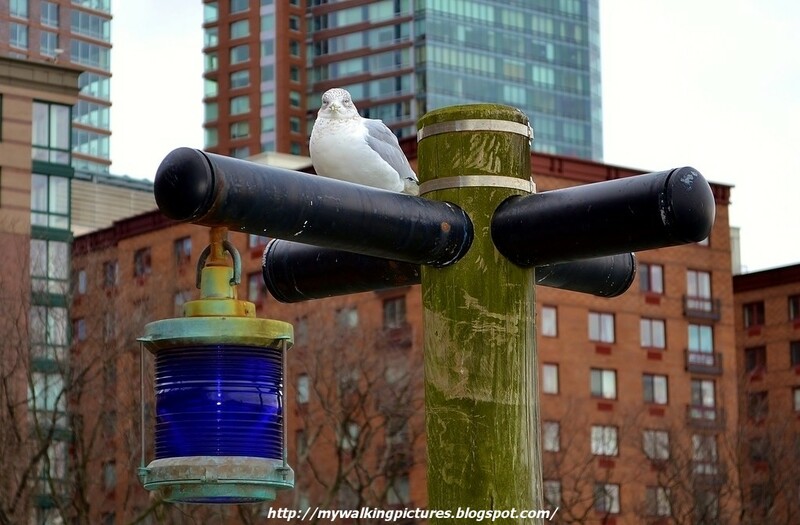 As I was walking and looking at the blue lamps, this seagull was staring right at me. South Cove is a place based artwork, the piece incorporates natural materials, plantings, constructed elements, and the water and sky themselves to create a beautiful and very moving environment. The building you see at the end is the Museum of Jewish Heritage. 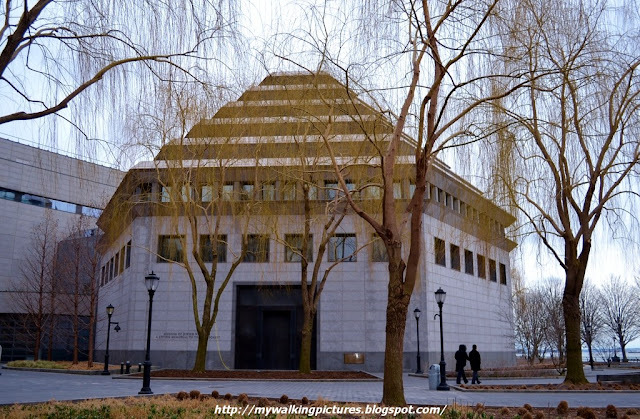 The 30,000-square-foot Museum of Jewish Heritage is located on the waterfront, it has a six-sided shape and tiered roof symbolic of the six points of the Star of David and the six million Jews who perished in the Holocaust. The Museum goes beyond recounting the horrors of the Holocaust; Its mission is to educate people of all ages and backgrounds about the broad tapestry of Jewish life over the past century - before, during, and after the Holocaust. The path curved at this point and led me to the Robert F. Wagner, Jr. Park, the southernmost park in BPC. Robert F. Wagner, Jr. Park is located in the southernmost tip of Battery Park City. A wonderful mix of open lawns and intensively planted gardens, threaded through with paths and walkways, Wagner Park is a place to explore. The Park Pavilions contain a restaurant, and its public roof deck affords breathtaking views of the Statue of Liberty and New York Harbor. 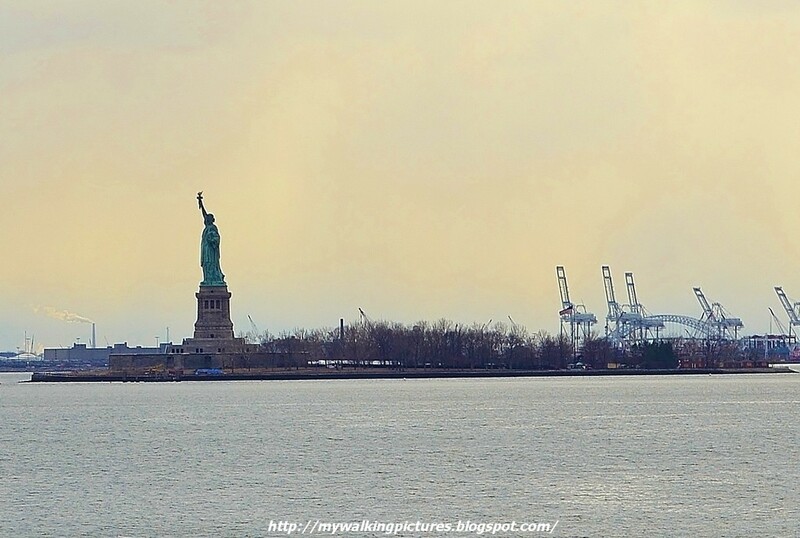 This is Lady Liberty seen from the public roof deck of the park. 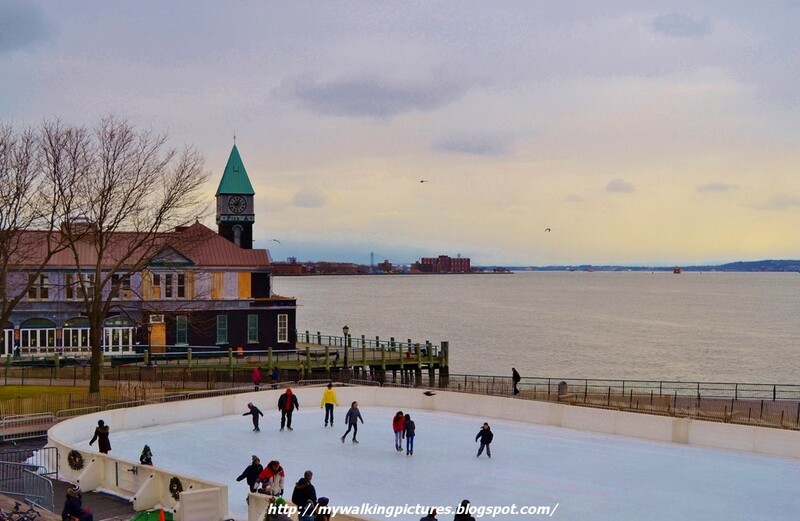 There is also a skating rink and the park has great views of Pier A, which is already part of Battery Park. 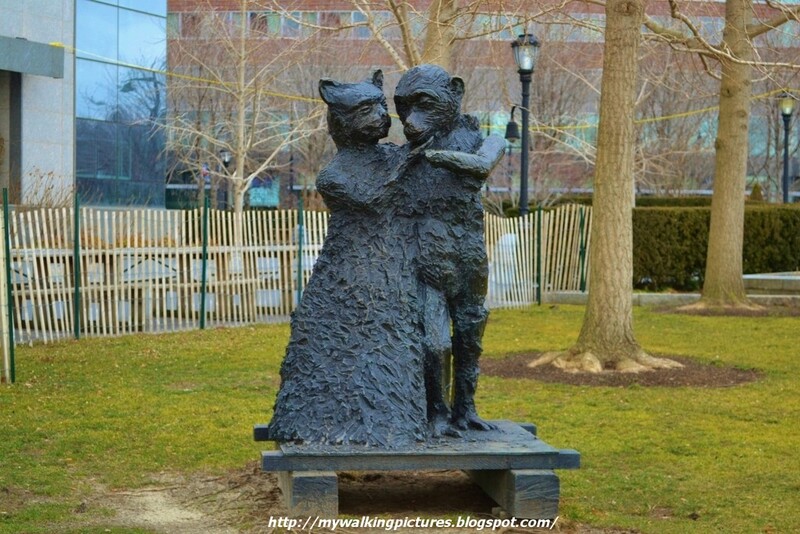 One of the artworks in the Park is Ape & Cat (at the Dance) by Jim Dine. Although they do not have human features, Jim Dine's Ape & Cat (at the Dance) exude the sort of civility and tenderness to which many urbanites aspire. Made of cast bronze, the figures are at once amusing, allegorical, and abashedly romantic. At my perch above the public deck at the Robert F. Wagner, Jr. Park, I can see the colorful buildings of BPC and One World Trade Center. 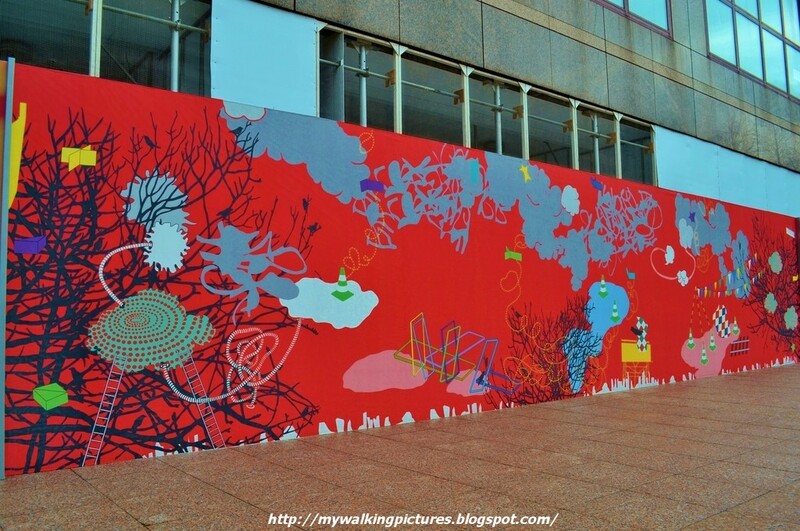 Another artwork is seen when you exit the park. 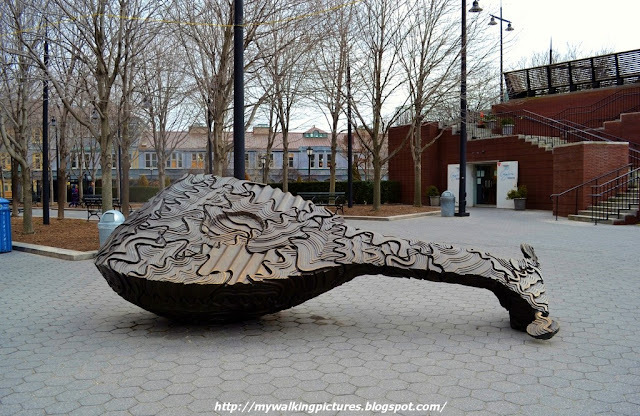 Titled Resonating Bodies, it consists of a pair of bronze sculptures resembling giant musical instruments. I wanted to continue my walk to Battery Park but I had a previous commitment so I left BPC, Battery Park up to Brooklyn Bridge can wait for another walk. 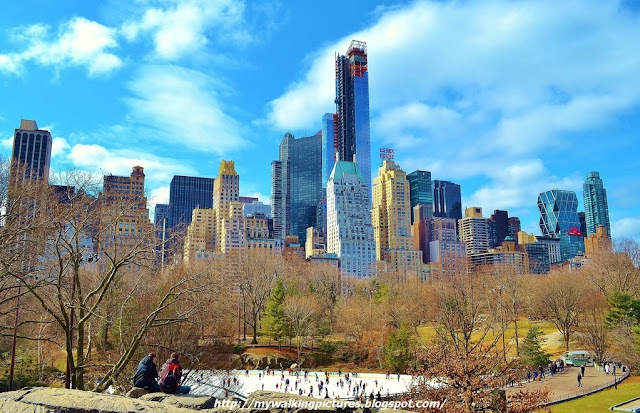 At the start of my blog I mentioned about dropping by Central Park and staying longer than I intended because of the view. Would you have stayed longer, too? But then if you know all the things BPC has to offer, you'll really find time to visit and walk around the area. Maybe in the summer when there are lots of free shows and concerts, I'll visit once again. Click on the links for more pics on my Flickr albums ..